Students, lawyers, bricklayers and musicians all converge upon the communal tables of Trattoria Mangia e Bevi at the lunch hour. Near Federico II University on the old Via Sedile di Porto, this trattoria offers simple Neapolitan fare including pasta and potatoes and sausage and friarielli at affordable prices. The draft wine is cheap, abundant and winsome. This scenic trattoria is named after the famous Neapolitan comics Antonio di Curtis, Eduardo di Filippo and the favorite local bean dish, pasta e fagioli. It gets raucous here on Saturday nights when roving musicians serenade diners and the draft wine flows freely. The antipasto Forza Napoli is not your average appetizer—it is gut bustlingly abundant . With mussels, fried pizza, buffalo mozzarella, beans and eggplant Parmesan…..etc, it is really more of a meal than a starter. This after hours fish spot is located in the middle of a favorite local fishmonger in the Pignasecca market neighborhood. Throughout the day they serve fried fish cups and simple fish pasta dishes, but the time to come is for dinner. Something about sitting in the middle of an old tiled fishmonger is magically cinematic. 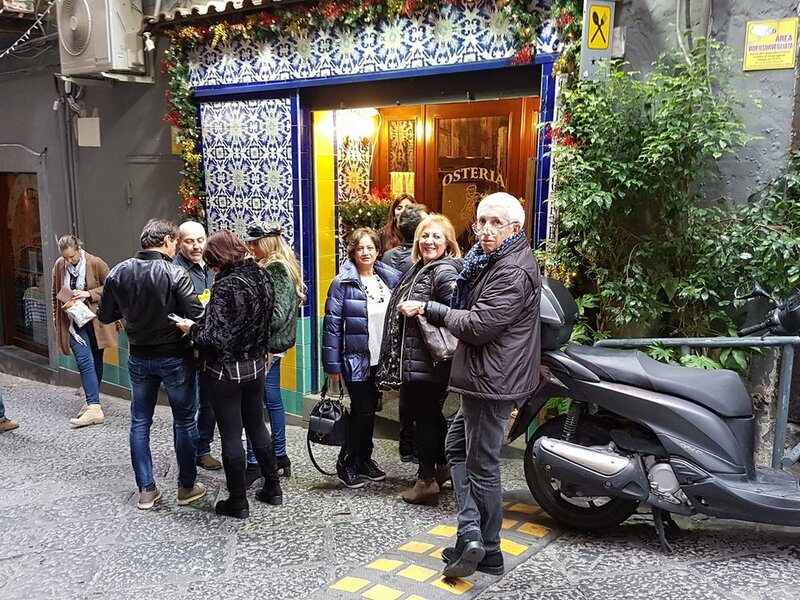 In the middle of the covered market of the Mergellina neighborhood, this informal trattoria for years has attracted American consulate employees and local office workers. The day’s special plates sit under a glass covered deli counter, where you queue to order and then take your food to no nonsense Formica tables to eat and DRINK abundantly. You’ll learn about local life in Naples here while enjoying excellent Eggplant Parmesan. Oh Malinconico…. We love this place. And who we really love is the chef-owner Marianna. After her husband passed away, she took over the trattoria kitchen and has kept a decidedly local loyal following ever since. While you could call the cuisine here rustic, that would not do justice to Marianna’s refined understanding of Neapolitan cucina povera. This little Chiaia osteria is gem and blast from the past. Old photos decorate wood paneled walls and the same diners have been coming here for Saturday lunch for years. Come with a group of friends, order plates to share and take in the ambiance of old Naples. 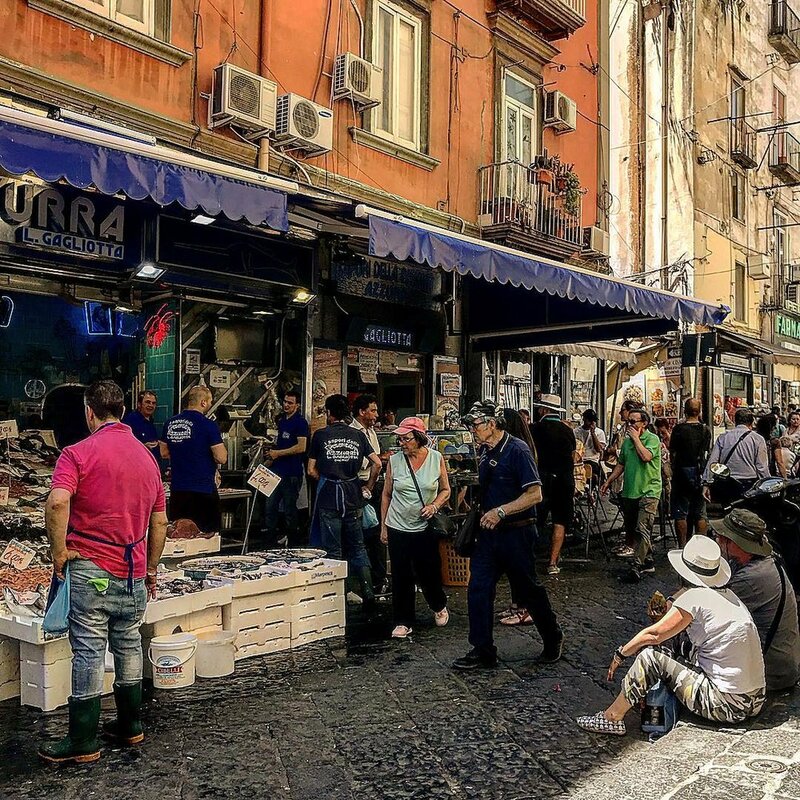 You cannot come to Napoli without visiting the iconic Spanish quarter. While Nennella has become a wild tourist favorite of late, we prefer Gobetto. Stroll up the sloped narrow alleys of the Quartier Spagnoli and enjoy the congenial service at this dining institution. Arguably serving the best polpette (meatballs) in Napoli, this trattoria is jut across the entrance to the Napoli Sotterranea tunnels. Come here hungry and treat yourself to the full Italian lunch of antipasti (appetizers), primi (pasta) and secondo (main dish). Located off the main Vomero Piazza Vanvitelli, Elvira offers asset menu of primo and secondo with all you can eat contorno (sides) buffet. Locals and visitors alike flock here for the abundant portions and affordable prices. Be advised, you will over eat here. Select your stretchy pants accordingly. When to Come: For dinner after visiting the San Martino Cloisters and Castel Sant’Elmo. Better yet walk the Pedementina stairs from lower Napoli to Vomero so that you can earn your subsequent caloric intake!! One best Genovese pastas in Napoli. The braised onion and meat pasta dish is a highlight, but anything on the seasonal menu here is excellent and just like nonna would have made it. On a genteel corner in Vomero, come here for dinner and a movie or a after a visit to the theater. When to Come: For dinner after a visit to the cinema or theater.